250 thread count 100% cotton. Bold colours and refreshing prints combine to create the Dahlia Bedpack, a refreshing set that will enhance any bedroom interior. Crafted from 100% cotton, this inspiring set is breathable and easy to care for, making it a great option for regular use throughout the seasons. • Single and king single bedpacks include one duvet cover, one standard pillowcase, one European pillowcase and one 43 x 43cm filled cushion. • Double, Queen, King and Super king bedpacks include: one duvet cover, two standard pillowcases, two European pillowcases and one 43 x 43cm filled cushion. 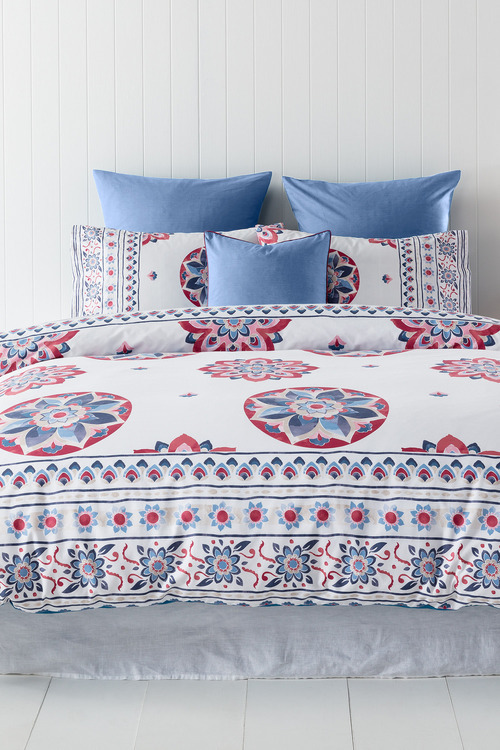 Available in a range of sizes, the Dahlia Bedpack will update your room in an instant and can be complimented with neutral sheets or matching bold colours.